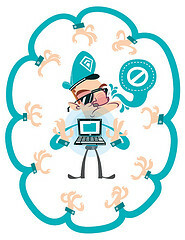 Internal concerns about Data Protection usually boil down to an individuals concern that the content they post on a social networking site, for example a message board of instant messaging site, may be subject to scrutiny by colleagues or managers who weren't the intended recipient. Individuals may also be concerned that their use of external social networking sites and the adverts that are shown on these sites may also reflect badly on them. For example if you're looking at Facebook or watching a video on YouTube and an inappropriate advert is displayed, does this reflect badly on you and will this be seen by line managers? So how should concerns around misuse of personal data within the workplace be handled. The author outlines two approaches. The first was to enforce the Data Protection act within the workplace. This might work if the social networking site is based in the UK but in most cases is going to be difficult to enforce. The second option is to educate users. This strikes me as a much more effective way to protect individuals and organisations from any data protection issues. The final part of this article looks at how data protection issues affect an information managers work, especially where they might be involved in preparing policies around individuals use of social networking sites. Again the key is to ensure individuals are educated about the use of social networking sites, either through training or by providing guidelines and documentation around the use of social networking sites. This entry was posted on Thursday, 22 December 2011 at 09:30 and is filed under Data Protection, Social Networking. You can follow any responses to this entry through the RSS 2.0. You can leave a response. I'm not sure how to contact you. So I decided just to leave a comment. I'm a final year student of Nottingham Trent University doing my degree in Interior Architecture. Currently doing my dissertation on public libraries. I have taken the Peckham Library and Whitechapel Idea Store to be my case studies. As I am a student in Notts. I'm having trouble in getting people who went to the two case studies before to fill in some surveys for me. May I ask if you have many followers on your blog that have gone to the two libraries? I need your help so that I could get as many surveys done as possible. Is this possible?? Sorry for the trouble. Hope you can help.